Get access to the full source code at GitHub. If you are a developer, feel free to contribute with the project. You decide if you want your customers to log in or just use a form to create a ticket. Give your customers support by writing articles about frequently asked questions and How-To Guides. We currently support 10 languages and adding more! Provide your customers with a fully responsive and flexible interface. Find and segregate the tickets you want easily with our filtering and search tools. 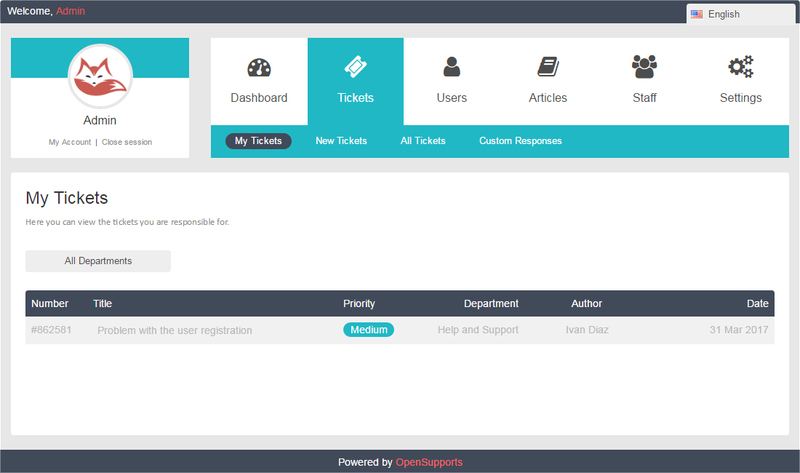 Write documentation and custom responses for common tickets. Manage responsibility with different permissions and roles for staff members. OpenSupports is an open source project stored at Github. You can contribute by reporting bugs, suggesting features, translating, or even writing your own piece of code. Our technologies are a perfect balance between modern development and compatibility.